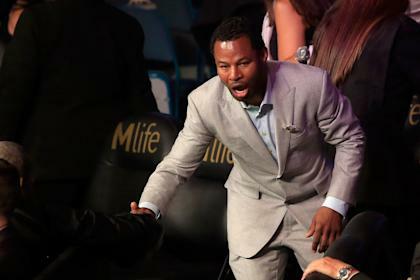 The promotion leading up to 43-year-old “Sugar” Shane Mosley’s return to the ring after a two-year hiatus in a rematch against Ricardo Mayorga has been comical at best and disgraceful at its absolute worst. When the two finally meet at The Forum in Inglewood, Calif., on Aug. 29, it will be the end of one of the most bizarre lead-ups to a fight in recent memory. What started with a seemingly out-of-nowhere feud on Twitter that sparked an unwanted rematch of their 2008 bout (which Mosley won by 12th-round knockout) has continued to dissolve into one peculiar occurrence after another. Everything is working against this fight. There’s the absurd pay-per-view price of $49.95 to watch Mosley (47-9-1, 39 KOs) face an opponent who hasn’t fought credible competition since 2011. There’s the fact that a highly anticipated showdown between Leo Santa Cruz and Abner Mares is taking place a few miles away at the Staples Center (on free television, mind you) at the same time. And then there’s the looming possibility of a cancellation due to a contract dispute between Don King and Mayorga. As if the haphazard promotion, led by Mosley’s GoBox Promotions, hasn’t had enough to deal with, things took a turn for the worse when the two fighters met at Tuesday’s news conference. Mayorga (31-8-1, 25 KOs), who is known for his zany antics, proceeded to lob a number of misogynistic statements toward Mosley’s girlfriend, Trista Pisani, who is also billed as the executive vice president of GoBox Promotions. Mayorga then took off his shirt to reveal a body that was clearly out of shape and nowhere near the 154-pound weight limit. But what happened next really sent things spiraling. After the fighters had the traditional face-off, Pisani was seen bending over in front of the Nicaraguan, who inexplicably gave a slap to the 31-year-old’s behind. Pisani shouted expletives, Mosley reached for Mayorga’s throat, and the two camps jostled briefly before order was restored. It was as ridiculous as it sounds. To make matters worse, Mayorga, 41, immediately spoke to Nicaragua’s Canal 4 to say the entire thing was staged. The statement was as bizarre as the incident, considering Mayorga’s penchant for odd behavior, and likely did little to help push ticket sales, which reportedly are under 3,000. WBC president Mauricio Sulaiman also distributed a release condemning the actions of both parties. Mosley co-trainer Kenny Porter (trainer and father of welterweight Shawn Porter) gave Yahoo Sports his team’s side of the story. Porter said he was caught completely off-guard by Mayorga’s actions but wasn’t surprised at all by his antics. Regardless of whether it was staged or not, the reality is this promotion is hobbling to the end. It’s not beyond the realm of possibility that the fight could be entertaining, but given the circumstances surrounding these two 40-year-olds who are trying to regain any semblance of relevancy, the sooner this is over the better.